"R & R," an affordable pet friendly cabin near Gatlinburg, places guests in the conveniently located in Bear Cove Falls Resort Pigeon Forge. 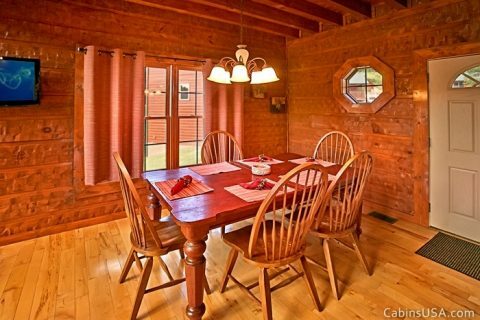 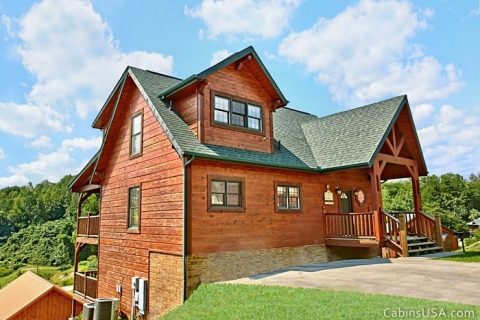 Bring the entire family, including those four-legged members, for a fantastic vacation in this lovely 3-bedroom cabin that offers enough space for up to 10 guests. 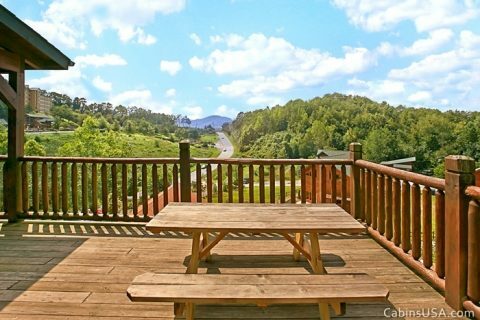 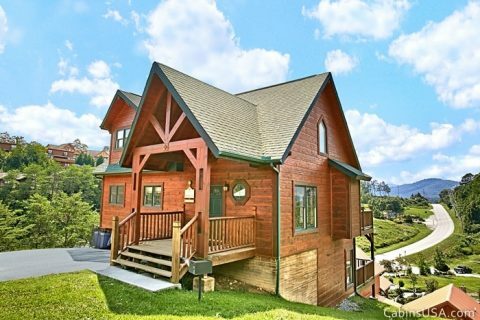 Your affordable pet friendly cabin near Gatlinburg lies less than a mile off the action packed Pigeon Forge Parkway with seemingly endless thrills and adventure at every turn. 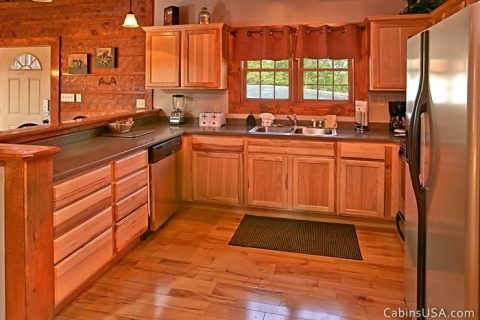 Your pet friendly cabin near Gatlinburg not only offers convenience, but it also boasts amenities that will have you feeling right at home. 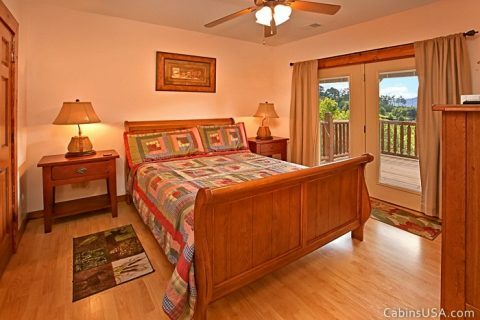 Elegant furnishings and décor invite you to relax and unwind in comfort. 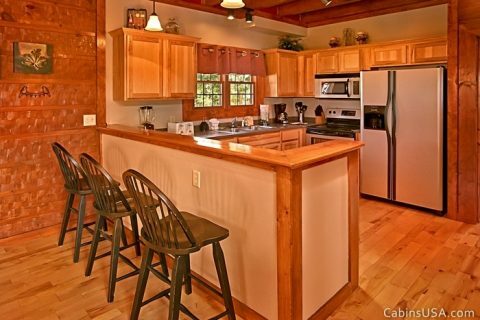 On the main level of your Bear Cove Falls Resort Pigeon Forge cabin, you'll find a spacious kitchen with ample counter space for cooking family meals that can be enjoyed around the nearby dining table. 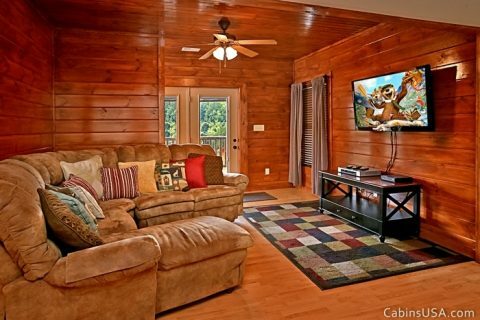 The living room, which boasts a sleeper sofa and an electric fireplace with stone mantle, offers the perfect place to watch a movie, and the large picture windows let plenty of light into your cabin. 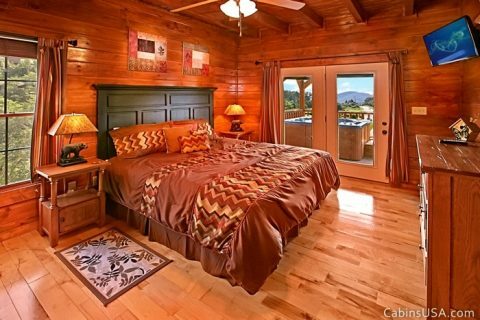 Your main level also houses one of two master suites, which features a king-size bed, jacuzzi tub, full bath, and private door to the back deck's hot tub. 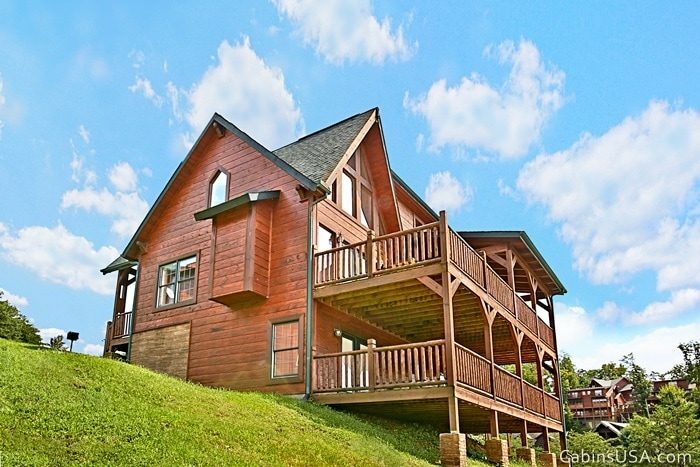 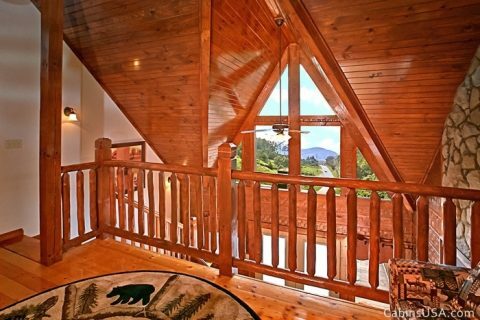 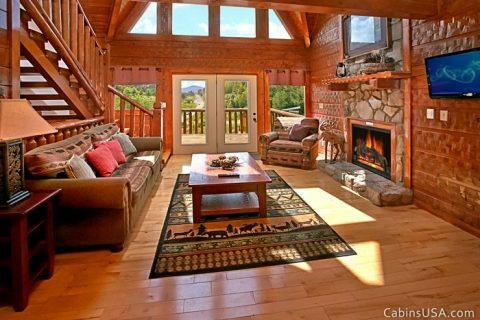 Upstairs, you'll find your affordable pet friendly cabin near Gatlinburg's other master suite. 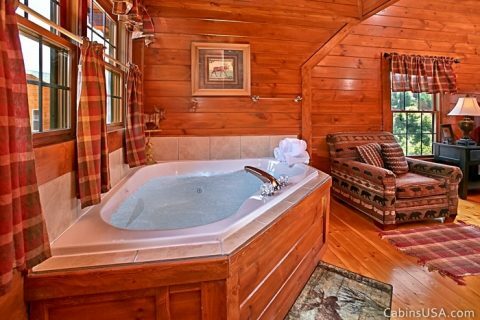 An in-room jacuzzi tub, king-size bed, and full bath create your own private oasis in the mountains. 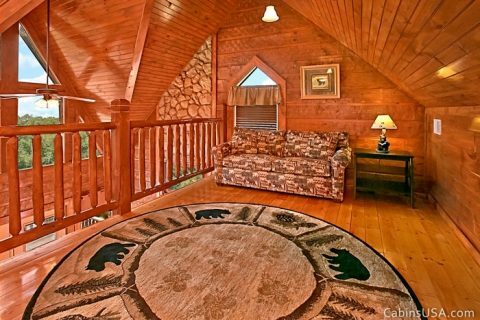 An additional sleeper sofa can be found in the loft. 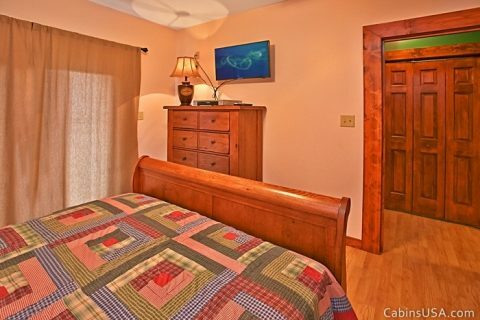 Downstairs, you'll find the game room with pool table, wet bar, card table, and a sitting area with television. 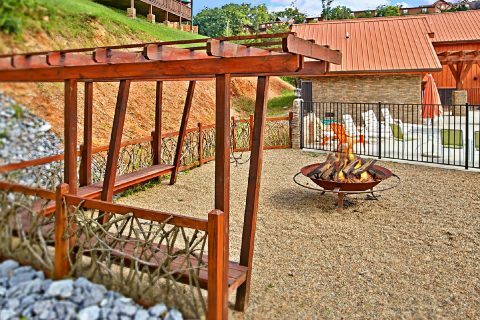 This is the perfect space to host a game day party with friends and family. 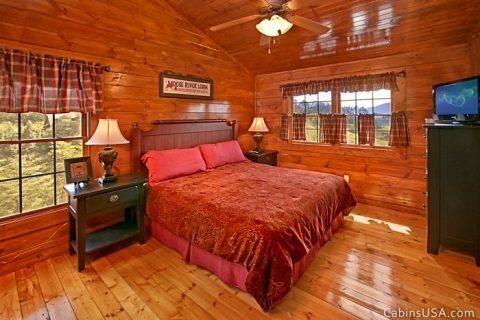 A queen bedroom with a television on this level provides additional sleeping space. 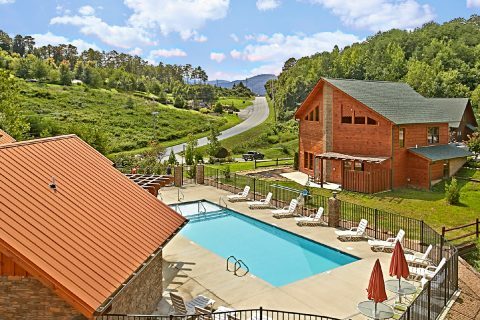 Start your vacation in Bear Cove Falls Resort Pigeon Forge today! 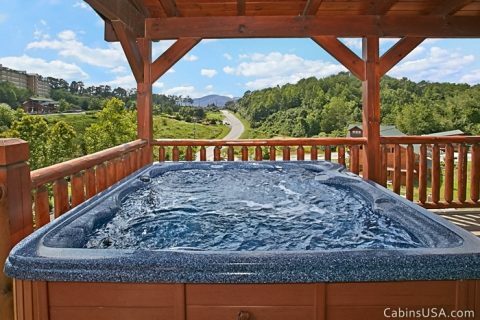 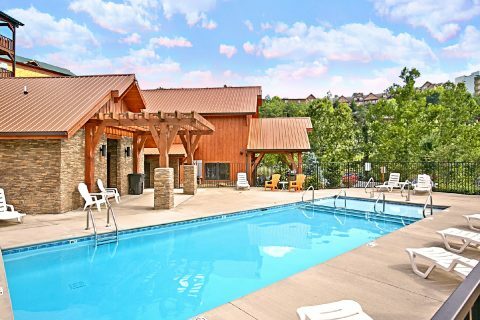 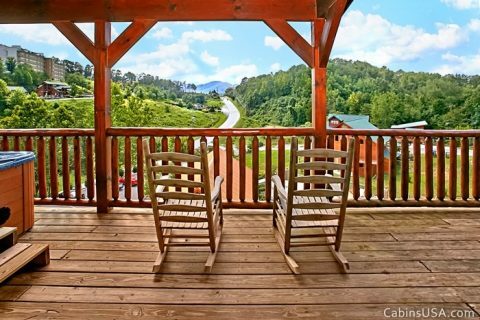 SAVE when you book your pet friendly cabin near Gatlinburg with swimming pool access online with Cabins USA Gatlinburg for an immediate Online Cabin Special!